Vibha discovered a passion for working with children with special needs in high school when she volunteered at an inclusive preschool. This passion was solidified in occupational therapy school. With two children herself, she realizes the value of the time and sustained energy needed for meaningful relationships as a family. She believes that therapy for the child should be so ingrained in the daily routine that it fits in naturally with the child’s schedule. She loves spending time with her children, reading books, yoga and swimming. Vibha holds a Clinical Doctorate degree in occupational therapy from the University of Southern California, Los Angeles. She has over five years experience working as a pediatric occupational therapist in private clinics and schools. 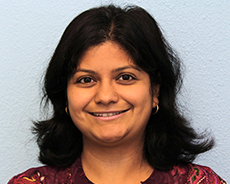 Vibha is certified in administration/interpretation of the Sensory Integration and Praxis Tests (SIPT) and uses a sensory integration lens and methods in her therapy.